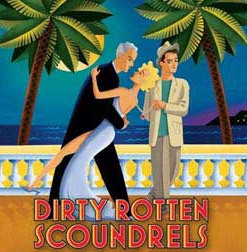 Based on the popular 1988 film, Dirty Rotten Scoundrels centers on two con men living on the French Riviera. The first is the suave and sophisticated Lawrence Jameson (Carradine), who makes his lavish living by talking rich ladies out of their money. The other, a small-time crook named Freddy Benson (James), more humbly swindles women by waking their compassion with fabricated stories about his grandmother's failing health. After meeting on a train, they unsuccessfully attempt to work together only to find that this small French town isn't big enough for the two of them. They agree on a settlement: the first one to extract $50,000 from a young female target, heiress Christine Colgate (Scott), wins and the other must leave town. A hilarious battle of cons ensues, that will keep audiences laughing, humming and guessing to the end!